Sedona is a kind of Mecca for New Agey types. In the mid 80’s it was discovered that this red rock area deemed sacred by Native Americans, had a number of vortexes, where energy flow can be detected. I hadn’t actually heard about the vortexes until I was in Flagstaff, so I decided I’d like to find out for myself. The Bell Rock trail is quite easy, a wide, flat, maintained path however under the midday sun I looked with an incredulous eye at the people setting off with half a bottle of water between two and no hats. It’s not an uncommon sight to see under-prepared people hiking trails. Climbing to the Bell Rock vortex is not so easy. At first I didn’t think I would make it as it looked too taxing. After refuelling my energy tank I started the climb up, ascending a smooth, steep rock on all fours, negotiating a path across the rockface. I came across a woman coming down and asked if she’d felt the vortex and she described it as a spiralling tingle in her fingertips. I was excited and I wanted my fingertips to buzz too. This gave me the last bit of motivation I needed to get to the top. I found a little place to rest towards the top, breathed in deeply and waited. I waited while I listened to two guys talking about the climb. I waited while watching a woman get her crystals out and meditate. I waited while absorbing the landscape around me. I didn’t feel the vortex. Not even when I pressed my fingertips into the rock and closed my eyes. It was disappointing. I continued to wonder about this as I climbed down, and as I was walking the trail back to the car, decided that I would go to see a psychic to have my tarot read in order to feel some kind of spiritual connection. 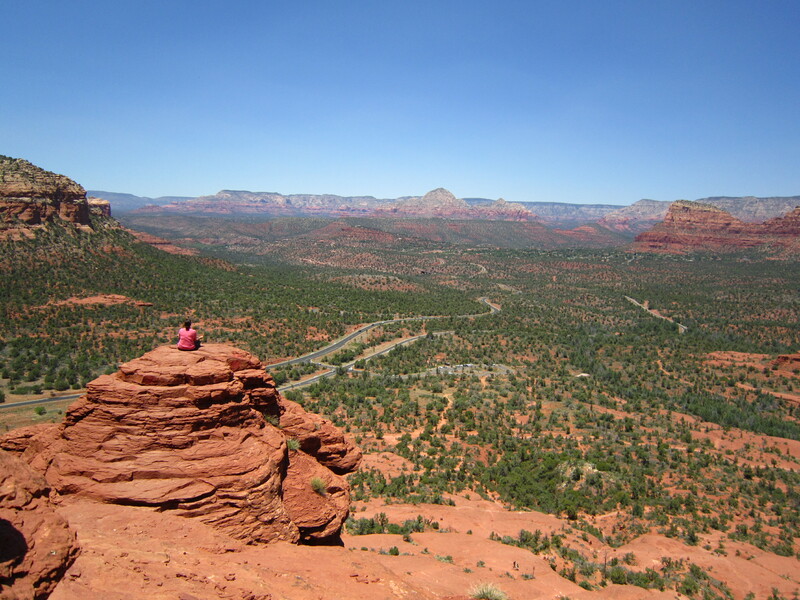 There are lots of psychics and the like in Sedona. I chose Madam Bonnie for the cute little location and walked in to have my palms and tarot read. I had never had my palms read before, so it was interesting to see what they had to say about me. There were some really accurate descriptions of things that have happened in the past and some curious predictions for the future. Madam Bonnie could tell that I was restless as, apparently, my chakra was all over the place. She said she could do some chakra healing, and as I was in a “let’s just try things out” frame of mind, I took her up on this. When you pay for a chakra healing, you are not paying for the time they spend doing this, rather for the process. It involved three stones being placed on or under my body and then having my body touched with a stone 10 times. Each time the stone would knock on a gong three times, kind of like cracking an egg, then a vibration would sound and Madam Bonnie would press the stone in each of the chakra places on my body. I felt calmer and more relaxed when I got up, but as chakra healing isn’t instantaneous, I have to call Madam Bonnie in a week to talk to her about how I’m feeling. I’m curious to see whether there is any difference. So whilst I didn’t get the free spiritual connection at the vortex, I did get a spiritual experience from Sedona.